When Feng Lan's brother encouraged her to play the virtual reality game Second Life, he told her that as a girl, she'd be doted upon. To prove that she could be a better player than him even without a handicap, she was granted her special request for a male avatar. Her adventures in this online RPG begin, as she discovers both the game and what it's like to be thought of as a boy. The story was SUPERB! The cliffhangers were awesome, the plot was breathtaking, and the ending was SDHGSDNS (i have no words). This manhua would definitely be enjoyed by those sci-fi, fantasy, shounen ai, comedy, adventure, and action enthusiast. The art was okay, the dialogues where easy to understand, and the words doesn't get tangled up like other manhuas/mangas. THE CHARACTERS ARE WONDERFUL. THERE ARE HOT GUYS EVERYWHERE. SO FOR THOSE OF YOU WHO ENJOYS READING MANHUAS/MANGA WITH A LOT OF HOT GUYS, I DEFINITELY RECOMMEND THIS ONE. As an avid fujoshi, i really enjoyed this manhua. There are no biases or hate against gender. So for me, i really enjoyed those gay moments with Prince x Gui and Prince x Wicked *drools*. The comedy always made me crack up, and the romance made wish for more. Overall, this manhua is perfect for me, tho i didn't enjoy the ending a little bit because of the kids, but still, this is a must read. 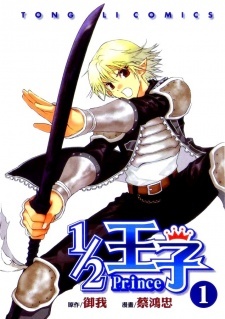 So 1/2 prince started out like an average manga (or manhua) to me, classic storyline about an online world where the protagonist would eventually triumph all and complete the game; Although I was still thinking of dropping it 4 chapters In, I still kept going- maybe the bishies played an important role...- and I'm glad I did! The characters developed and we learnt about them and faced their problems along side with them. I found myself laughing several times and really enjoying reading It. Although most of the story was within the game, It seemed to me that throughout the book the author was still deciding when to properly involve the real world with second life. S/he kept randomly throwing in chapters in the real world with Feng Lan finding her odd squad members and trying best to act like she didn't know them. Although in a genderbend mang- MANHUA you would need to have these sort of problems but they seemed too randomly scattered around to me. Anyway as the plot progressed we met new characters and I really developed a connection with them. By the time the whole 'Self aware NPC' came along the plot started to go downhill. At the beginning I was okay with Kenshin and Sunshine but the Dictator of life and all his cronies just got a bit annoying. After we thought the battle was over and price or Feng Lan died, they began the battle in the REAL world. And thats where the manhua dropped. Suddenly we met all our favorite bishies in real life! It was an interesting chapter getting to know all of the characters all over again but one that i would have not desired. Everyone then knew prince was a girl and 'ops!' thought the author 'I forgot to add the romance in!'. Then there became an overload of 'Which one? Gui or Wicked' and because the author DID add a bit of romantic feeling during the book of Gui and Wicked liking prince but s/he didn't give her a opinion, making me feel that she shouldn't have ended up with anyone. But the author didn't listen to my shriek of 'DOOOOOONNNNN'TTTTT', and for some reason she ended up with Gui. Although I wasn't pleased with this 'what i though was the ending', i would have still accepted it and wouldn't have to write a review to rant about the REAL end of it. In three pages it had been ten years. Three pages just saying 'HE MARRIED HER, SHE MARRIED HIM, THEY WENT TO EXPLORE THE WORLD, THEY ARE STILL IN THE GAME, BLAH BLAH BLAH' NO! WHY! WHY DID IT HAVE TO END LIKE THAT! After a get up and shout and stomp around my room O got back in to bed to finish the... WHY ARE THERE MORE CHAPTERS! YOU'VE ALREADY STOMPED ON THE STORYLINE, JUST STOP IT! But after that i still (reluctantly) carried on. A story about their kids in second life trying to figure out whats what... are you serious? It finishes like this?! Well i haven't finished the whole manhua yet so ill see how it REALLY ends but i still recommend it because although i'm feeling so much anger and pain, i thoroughly enjoyed it (except the end)- Also the art is absolutely amazing! You shouldn't be discouraged by the gender bender factor, because its only there for the major comedic effect. The manhua deals with a game world, and has good action scenes. I'd say it is a cross between shounen and shoujo manga with well paced action, and just enough romance to not turn it sappy. You see great character development while enjoying the awesome comedy that is bound to make you laugh in every single chapter. The interactions between the many different and unique characters make for a great story. Ofcourse i must mention here that the story is brilliant!. If you pick it up.. I'm pretty sure you won't regret it. Well, I didn't expect much seeing how this is the first manhua I've read, but, 1/2 Prince actually turned out to be my 2nd favorite read. Manhua, manga, manhwa~ They are all the same, really =P. Anyways, 1/2 Prince is outstanding and I'll tell you why. I gave the story a 10 because, well, it appealed to me at least. I like the whole virtual world thing and the strong female character, Feng Lan. She has a 19 year old twin brother who really doesn't think a girl can be good at a video game. She is angered by this and actually ends up being the first person to play the virtual reality game, "Second Life". It is supposed to be 99% like real life, and you actually get to look like how you look in real life. Feng Lan is the first to sign into the game and therefore, gets to have a special wish from a so called NPC. She finds out that this NPC isn't really an NPC but a secret moderator for the game. Feng Lan asks to become a male in the game because she doesn't want her brother to know it's her. The NPC grants her wish, making her the only gender bender in the game, and the excitement continues from there. She becomes stronger, meets people from her college, and makes a lot of interesting friends XD. There is comedy, action, and even a little romance kicked in there. This is why I think 1/2 Prince is outstanding O< It is, overall, definitely above average. The characters...wow. They are fun, they develop, they can be violent, they can be funny, they can be serious, they can be scary. All of them are unique and loveable. I don't think there is one character that I can truly hate. The plot is enjoyable as you are constantly watching Feng Lan, AKA "Prince" in the game try to keep her identity a secret from her real life. She also becomes a leader in the game and has to be strong for all her followers and friends. She is Prince, but at the same time, she is Feng Lan. It gets pretty crazy after a while. Overall, 1/2 Prince gets a 10. Skip Beat was before the only one I could give a 10 to, but 1/2 Prince deserves one too. What happened to this scanalation group?